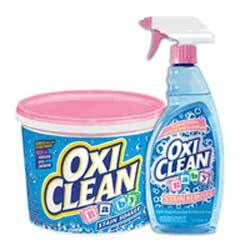 OxiClean® Baby Laundry Kit When you have a baby, you know stains happen every day! With OxiClean® Baby, removing those tough baby stains out doesn’t have to be a chore! OxiClean® Baby is specially formulated for removing tough baby stains including baby food, formula and diaper leakage. A non-irritating baby stain-fighting solution that is 100% free of fragrance, chlorine, detergent, dye and residue, so moms feel safe knowing it will not irritate their baby’s sensitive skin. The same non-irritating baby stain-fighting solution as our Baby Stain Soaker, in a convenient spray.